It's time to D-d-d-d-d-Duel! Konami's Yu-Gi-Oh! card game took a lot of my time and money as a young man, and I was absolutely obsessed with the associated Anime series. As soon as I saw the announcement that Figma was making a figure for Yami Yugi I knew I had to add him to my collection. To see one of my favorite childhood characters brought to life with this kind of care and attention to detail is incredible. Even more incredible is that they also released a matching Dark Magician Girl! Now I just need a Dark Magician to complete the trio! 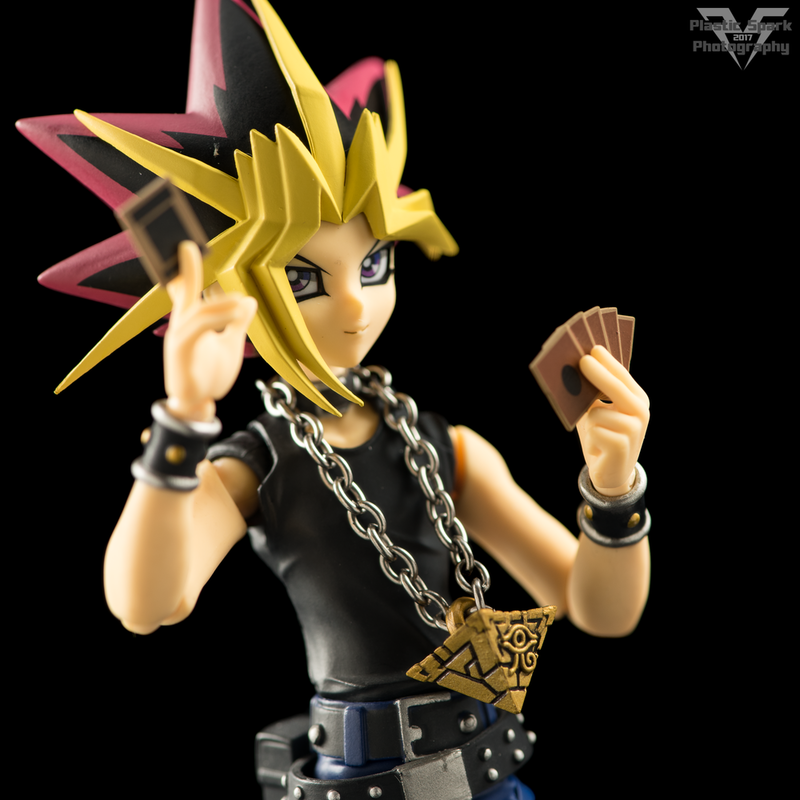 Let the Heart of the Cards speak to you as we check out Figma Yugi in this review! "I summon Dark Magician Girl in attack mode!" No beating around the bush here, I love this figure. Figma absolutely nailed Yugi's aesthetic, especially so on his hair. Yugi's hair is easily one of the most over the top examples of crazy anime hair ever and many attempts have been made to replicate this iconic look in plastic to little success. Most action figures of Yugi came out with rounded, dull looking hair pieces, likely due to toy safety guidelines. Luckily for us when Yugi was set into plastic as part of the Figma line up no such limitations were applied and we are left with an incredible, sharp, detailed hair style. The same level of detail follows on the rest of the figure with Yugi's studded belts and wrist bands, all picked out with paint. He is clad in a fairly basic outfit consisting of dark blue dress pants and a black tank top. His coat is included as an accessory that pegs into his back in windswept fashion. I would have liked if an extra upper body was included with his coat as this was the most common outfit in the anime. In the manga however it was more common to see Yugi take off the jacket and wear only the tight black undershirt and his millennium puzzle when taking care of business. His articulation is standard issue for a modern Figma with a plethora of removable 2 axis joints at the neck, shoulders, elbows, wrists, knees and feet, ball jointed hips and a ball joint at the waist that also allows for a mild ab crunch. Nothing special but perfectly capable of achieving the majority of poses that a human body can achieve. Certainly more than enough to emulate his classic poses from the anime and manga. Yugi includes a multitude of accessories to complete his look. The coat I already mentioned, which is sculpted in a windswept motion. It pegs into Yugi's back and wraps around his neck. It is incredibly tight the first time you attach it so be careful and patient with it. He also includes his most iconic accessory; the Millennium Puzzle. The puzzle is perfectly recreated with sharp details, and a brilliant paintjob of deep gold w/ a black wash to bring out the details. Top it off with a real metal chain and we have one awesome accessory! Two different card accessories are included; one single card, and a fan of five. He also comes with the season 2 duel disk complete with a deck of cards installed in the disk. The duel disk is a replacement forearm that is easily swapped in by removing Yugi's arm at the elbow joint and swapping in the duel disk forearm. He comes with a multitude of replacement hands as well including closed fists, open fists for holding items/weapons, spread hands, a pointing hand, a card flourish hand and card holding hands with the index and middle fingers extended. The right hand is molded to hold a single card and the left is meant to hold the five card fan with a thicker gap between the fingers and thumb. Yugi also comes with 2 total face plates. One is a neutral, confident face with a cocky smile. The other is a more determined, serious face with intense lines between the eyebrows echoing the art style of the manga and anime. I was pleasantly surprised to find that instead of painted on eyes, Yugi actually included replaceable eye plates. You can use a combination of either face plate with one of the 3 eye inserts to allow Yugi to look left, right, or straight forward with either facial expression. I think there was room for a few more faces, perhaps a shocked face for when his opponent pulls out an amazing card at the last moment and I personally would have really loved a more sinister face sculpt with the glowing eye of Anubis on his forehead. I always liked how Yami in the manga was just a little bit evil and had no patience for fools or cheaters, punishing them with mind, body, and soul altering penalty games. If you're a fan of the Yu-Gi-Oh! series, be it in animated or print form you absolutely owe it to yourself to check out this amazing figure. I can't recommend it enough! Check out the gallery below and let me know what you think in the comments below! You can also message me on Facebook or email me I can be contacted at plasticsparkphotography@gmail.com. Let me know if you have any questions, photo requests, or review requests!